The visual is straight out of a John Hughes movie. "Bring It Back," the third single off of Lil Yachty's debut album, dropped on Thursday night. 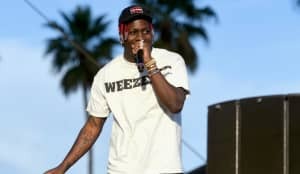 The 19-year-old rapper's upcoming album, Teenage Emotions, is due out later this month, and in the meantime he's been giving fans a varied selection of cuts. Earlier this month Yachty debuted "Harley" and "Peek A Boo" featuring Migos. On this latest visual, the rapper channels all the 80s prom scenes he's seen over the years. Lil Boat pines for the return of a girl over a synthy beat and drums that recall "Don't You (Forget About Me)" from The Breakfast Club. The cover art features the rapper sitting alone in a cheesy green tuxedo surrounded by balloons, the loneliest boy at the big dance. Watch the "Bring It Back" video above. Teenage Emotions comes out May 26.